Massive coolers are generally a few things: a nightmare to fit, turbine-loud and incredibly obstructive to everything in the surrounds of your CPU socket. 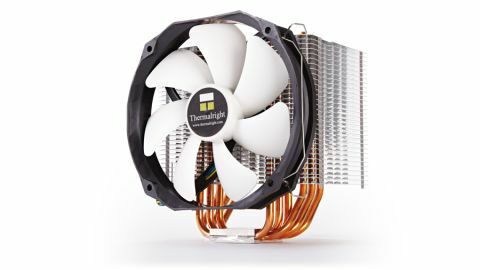 Thermalright's huge Macho Rev.A cooler takes all those preconceptions and changes the rules. It's giant, but only needs a GCSE in metalwork to fit, not a full engineering degree, stays whisper-quiet, and won't have you digging around for low-profile RAM like the Tactical LP sticks. The important thing to take away with from this review is that the Macho Rev.A isn't designed to ship huge amounts of heat away from heavily overclocked CPUs. Despite its chunky fan, this is not a high-performance chip cooler in the traditional sense. That's not to denigrate the Macho Rev.A though - it's designed to keep your CPU cool, while producing very little noise. You won't get industry leading cooling performance here, but that 140mm fan is so quiet you can barely hear it - especially when it's fully mounted in a chassis. That's because it's initially set up running at just 600rpm. In fact, it occasionally dropped below that, triggering my motherboard's fan alert. At that speed it's practically silent, and because of the large heatsink and six heatpipes, it was still able to keep my stock-clocked 3770K running at just 66°C under full load. Things were different when we started waving the overclocking stick around - it still kept the chip below the thermal junction, but at 90°C under full load at 4.5GHz it's a little warm for regular use. The fan would only spin up to 1,275rpm, so it wasn't able to shift enough heat away from the chip when there was that much waste energy produced. It was still very quiet, but not so useful for the OC brigade. The Macho Rev.A is also a really well made bit of kit, with a solid CPU mounting. You need to remove your mobo to fit it - no matter if your chassis has a cut out behind the CPU or not - but it's not a difficult build outside the case and the fit is incredibly sturdy. I'm also a fan of the heatsink design. The offset fins shift the whole cooler away from the DIMM slots so there's no interaction between them at all, despite there being a chunky fan attached too. It's well thought out, and so simple you wonder why it's not used for all such chunky coolers. The Macho Rev.A is a really rather impressive cooler. It's not ideal for overclockers - they're well catered for with the liquid chillers - but it's perfect for the stock-clocked masses who don't want their PC to sound like a Harrier jump-jet in rapid ascent. It's well designed, well built and whisper quiet - a quality massive cooler.